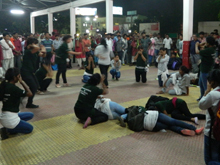 As a part of the awareness programme, ASDMA in collaboration with DIPR undertook a series of Street Plays on Earthquake Safety starting from April 23, 2012 in the various locations of Guwahati. The Street Plays started off at the Regional Science Centre, Khanapara commemorating Earth day on April 23, 2012. The play was performed in the presence of a large gathering of school students. School routines with earthquake messages were distributed among the students. Engineering Consultant from ASDMA made a presentation on ‘Know Disaster, No Disaster’ before the students. Subsequently, the Street Plays were staged in other parts of the city and culminated at the premises of Assam Secretariat Complex in the presence of Shri PrithiviMajhi, Minister, Revenue and Disaster Management, Shri Atul Chaturvedi, CEO, ASDMA, Shri PabanBorthakur, Commissioner and Secretary, Finance Department and other officials of State Secretariat. Another exhibition was carried out at the 72nd Session of AsomSahityaSabha in Barpeta fromJanury31- February 5, 2013.Various IEC materials of ASDMA were displayed at the exhibition and about 1650 people visited the stall. A Quiz Programme was conducted and the winners were awarded with gifts like cups and pens embossed with ASDMA Logo. Volunteer registration was also carried out at the exhibition. ASDMA carried out an exhibition at 14th North East Book Fare in Guwahati from December 30, 2012 - January 10, 2013 on Information, Education and Communication (IEC) materials and reports published by ASDMA and about 1000 people visited the stall. A Quiz Programme on different aspects of Earthquake, Flood and Landslides was conducted among the interested people who visited the 14thNorth East Book Fare in Guwahati. The winners were awarded with gifts like cups and pens embossed with ASDMA Logo. An exhibition was carried out on the various Information, Education and Communication (IEC) materials and reports published by ASDMA from December 28-30, 2012 at ManiramDewan Trade Centre, Guwahati. This was carried out as a part of the National Seminar on "Earthquake Hazards: Education, Preparedness and Management" organized by Environmental Watch and Management Institute sponsored by Ministry of Earth Sciences, Govt. of India.